Personalized lime gingham 44” arc expressions auto - open umbrellas are employed for gifting purposes by marketers in creative niches. 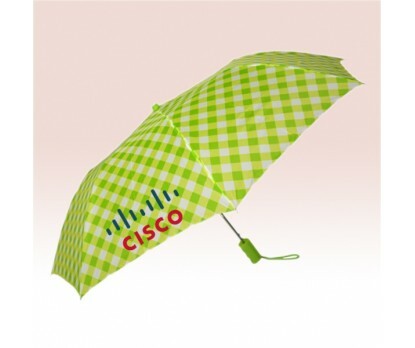 This polka dotted umbrella makes a great sheltering choice as well as fashion accessory in all seasons. People will treasure it for long due to its pretty design. Features - plastic handle, auto open function, metal shaft, and 44” arc polka navy, lime, and white polka dotted canopy. Dimensions - 44” arc folds to 15”. Imprint area - 91/4” W X 6 ¼ H X 6” Top.